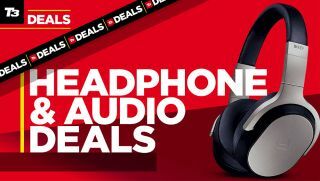 Black Friday, Cyber Monday and the rest of the ongoing online sales events are a great time to pick up a deal on headphones, speakers and other audio. We’ll be updating regular like, so keep checking back. Obviously, there are a billion deals out there right now, but we’ll sift through to find the cream of the crop: big brands with big discounts. Looking for deals on everything from laptops to mobile? Head to the rest of our Best Black Friday and Cyber Monday deals. Head on over to Amazon and grab yourself a pair of Sennheiser HD 598 Cs Around-Ear Closed Back Headphones (in black, of course) for £89 (that’s 55% of the RRP). That’s a GREAT DEAL. Richer Sounds is our top tip for audio bargains, but in general that involves trekking to its branches rather than buying online. However, it is doing a lot of DEALZ online, including Sonos Play:1 at £30 off, £139. That is a DEAL. Looking for an Ultimate Ears Bluetooth speaker? Can’t say we blame you. Currys has the UE Boom 2 at £99. That may only seem like a slightly stingy £10 off, but you can knock that down to £84.99 when paying, with the code UEBOOM15. Boom! John Lewis also has the stunning Sennheiser IE60 in-ears at a half-price £70. They’ll also do you a pair of Momentum on-ear headphones for £215.99 – the usual price, sadly – but throw in a pair of £69 Sennheiser Momentum I in-ears for ABSOLUTELY NOWT! Amazon is doing Bose’s excellent SoundLink On-Ear Bluetooth Wireless Headphones for £60 off. That still leaves it at £119, but it’s worth a punt. Google’s Chromecast Audio is half price at just 15 quid at Currys. Just plug it in to any speaker or system with a line in, and you can stream audio from any Android device, PC or Mac from a plethora of sources. That is an absolute steal for any Android-owning music lover. And for those looking to stream video, the same shop has the Google Chromecast for just £20, down from £30.